Christen Ferster has been a writer since 2003. She writes articles for LIVESTRONG.COM, specializing in weight loss, disease prevention and children's health. Ferster has clinical experience and is a registered dietitian. She has a Bachelors of Science in human nutrition from Winthrop University. You might have noticed that after eating fried foods, you tend to have abdominal discomfort. 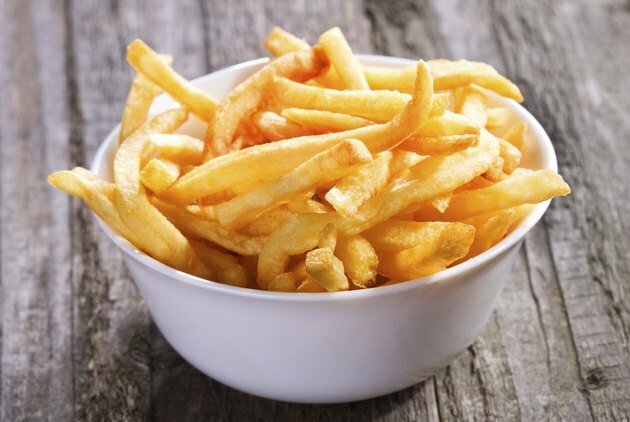 Because fried foods contain high levels of fat, they easily add to the waistline and can cause stomach pains. To prevent or help treat gastrointestinal problems, eliminate or severely limit your intake of fried and other fatty foods. Gastroesophageal reflux occurs when stomach contents rise up to the esophagus because the lower esophageal sphincter is not opening and closing properly, causing acids to rise up with the food, according to the National Institutes of Health (NIH). If you have this reflux more than twice a week, you might have gastroesophageal reflux disorder (GERD). Frequent burning in the lower part of the mid-chest, behind the breastbone and in mid-abdomen, also called heartburn, is one of GERD's main symptoms. The NIH states that fatty and fried foods can worsen reflux symptoms. If you have frequent heartburn or GERD, replace fried foods with non-fried, lower-fat foods. For example, choose a baked potato instead of French fries. Gastritis is the inflammation of the stomach's lining. Some gastritis can occur suddenly, but some occurs gradually over time. Often, an H. pylori infection causes gastritis. Symptoms include indigestion in your upper abdomen, nausea, vomiting, loss of appetite, belching, bloating, weight loss and a feeling of fullness in your upper abdomen. Avoid any foods you find irritating to your stomach, but especially fried foods. Though you cannot always prevent gastritis, you can reduce your risk by avoiding fried foods. Open sores often found in the stomach or upper small intestine, peptic ulcers can develop because of the H. pylori bacteria, according to MedlinePlus. Watch your intake of fatty foods, such as fried foods, to avoid increasing the pain from these ulcers. Indigestion, a more general feeling of abdominal discomfort, is usually not a serious health problem, according to the NIH. A common problem, indigestion can occur because of eating fatty foods. The NIH suggests reducing stress around meals, eating slowly and possibly taking over-the-counter antacids. Apart from the discomfort of feeling very full, eating fried foods can cause a variety gastrointestinal discomforts. Depending on how severe you experience these issues, you might be able to avoid the discomfort by cutting fried foods from your diet. Talk with your health-care provider if pain persists because he can best diagnose the problem and prescribe a plan for preventing or treating your pain. If you eat a lot of fried foods, look for replacements that are baked, grilled, boiled or broiled. Are There Foods That Can Cause Gastritis During Pregnancy?